Llys Y Seren, one of our Port Talbot based residential care home went all out on Friday 15th March as staff, residents and their families held a fun-filled event to raise money for Comic Relief and to take the opportunity to say thank you for the grant funding received by comic relief last year to deliver the ‘Creative reCollections’ project. The afternoon was action packed as Lee Trundle popped in to have a penalty shootout with the children from local school Awel Y Mor. Captain Beany also made an appearance and showed off some fancy footwork with the football too. 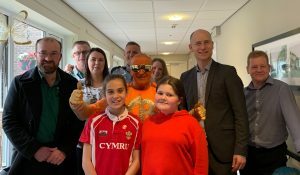 Llys Y Seren was also very pleased to welcome Stephen Kinnock MP for Aberavon and Manager, Karen Rogers was able to showcase all the creative projects made by the residents over the last year as part of the funded sessions. 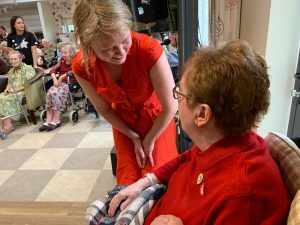 Creative reCollections gained funding from Comic Relief last year to provide engaging arts and creative sessions in our residential homes in Neath in association with Arts Care Gofal Celf who provided the professional artists, as well as The Arts Council of Wales and Welsh Government. 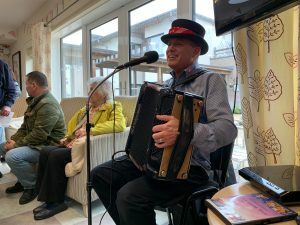 The project is now moving into year two as they look to train staff to deliver the arts sessions themselves to encourage stronger relationships between residents and those who care for them, as well as helping to address issues such and loneliness and isolation as people get older.